As with most ships, the most expensive cabins are on the higher decks. All of the staterooms are outside, and over half have verandahs (balconies). Standard features in all of the Crystal Symphony staterooms include down pillows and duvets, refrigerator and mini-bar, satellite telephone, and hairdryer. The television has a good selection of programs. The baths include deluxe Aveda toiletries and bathrobes. The passengers in the penthouse (PH), penthouse suite (PS), and Crystal penthouse (CP) staterooms on the penthouse deck 10 have personal butler service, which includes in-cabin daily hors-d'oeuvres in the afternoon. Let's take a detailed tour of the different cabin categories on the Crystal Symphony cruise ship. The deluxe staterooms on the Crystal Symphony seen in the photo above are similar to the deluxe staterooms with a verandah, except they have a picture window instead of a door to the outside. The deluxe stateroom with verandah is the largest category of stateroom on the Crystal Symphony. With 246 square feet, the deluxe stateroom with verandah on the Crystal Symphony is smaller than similar cabins on other luxury ships. (Other luxury ships often have over 350 square feet in the same class.) 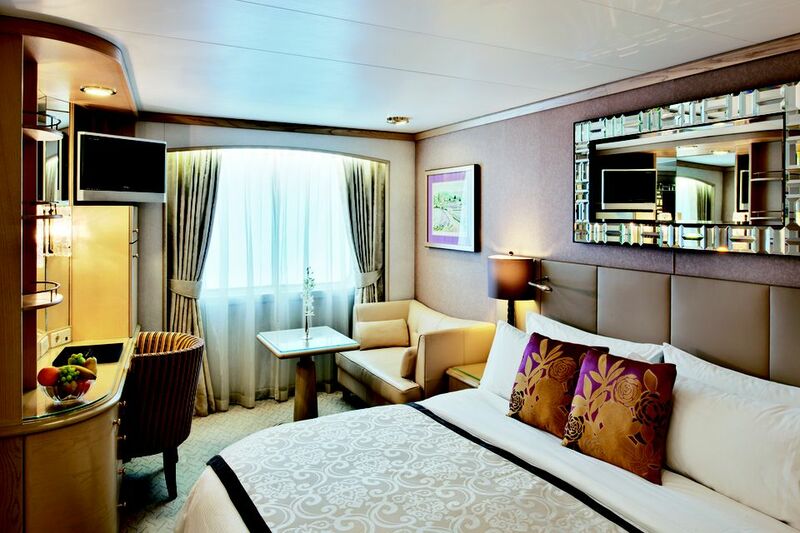 The deluxe staterooms have a small settee and one armchair. They also do not have walk-in closets. However, although the Symphony's cabins are smaller, the common areas are very spacious and the service is exceptional, qualifying the ships for luxury status. The deluxe stateroom with verandah on the Crystal Symphony include all the services and amenities seen in the deluxe staterooms with a picture window. The penthouse staterooms on the Crystal Symphony are very spacious and almost square, rather than narrow like many cabins with verandahs. They have a very nice sofa, desk area, and plenty of storage space, including a walk-in closet. There is no curtain dividing the sitting area from the sleeping area, which is found in many similar accommodations on other luxury ships. The penthouse suites do have a curtain divider. The cabins are equipped with two robes--a heavy terrycloth one and a lightweight one of cotton. The 491-square-foot Penthouse suites are over 100 square feet larger than the Penthouse staterooms and include a divider curtain that can be pulled to separate the sitting area from the sleeping area. The Crystal Symphony penthouse suites include all the amenities found in the Penthouse staterooms, plus two large windows/doors, two televisions, and a bidet in the bathroom. The two 982 square foot Crystal Penthouse Suites are the Crystal Symphony's most luxurious accommodations. The Crystal Suite has a small second bathroom for guests. Since most of us are used to two bathrooms at home, it is a good addition to the suite. The bathroom in the Crystal Suite is large and luxurious, with a separate tub and shower, bidet and toilet, and double sinks.